Contributed by Jessica Echols The group that participated in the poverty simulation in July 2014 discusses the impact the simulation had on them. Poverty simulations are a way of engaging and educating the community on poverty, what it is and how to approach it. Contributed by Jessica Echols Volunteers and partners families participate in The Christmas Shop. This past year the shop provided gifts for 92 families and raised $1,120 to the Van Cleve 6th Grade D.C. scholarship fund. Contributed by Jessica Echols Mary Ann Witte, the first director of The Agape Program, which is now Partners in Hope. TROY — Partners in Hope is celebrating its silver anniversary for empowering the community for 25 years. Partners in Hope’s story began with a woman named Paddie Foster. In the late 1980s, Foster was struggling with cancer when she told her minister, Rev. Mel Schlachter, that she had a desire to help people. He honored her desire and when people would come to Trinity Episcopal Church for help, they would meet with her. Schlachter shared how well this approach was working with the Troy Council of Churches, and several churches decided to join together to support a part time social worker to respond to the many requests for assistance received by the churches. Executive Director Jessica Echols said Partners in Hope started in autumn of 1990 with a desire to give a hand up rather than a handout. “It was a coordinated effort to get to know people a little better rather than just have them bounce from place to place to place,” she said. 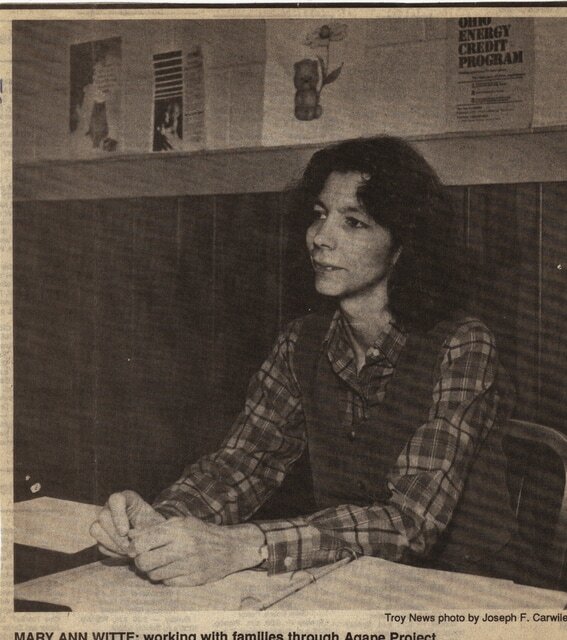 Mary Ann Witte was the first director. Partners in Hope was originally known as the Agape Project and was first located in the basement of the Troy Rec. The Agape Project officially became Partners in Hope in 1992 and moved to Mulberry Street. Partners in Hope moved to the current Franklin Street location in 2006. Over the last 25 years, Echols said that Partners in Hope has worked with three major areas. “We have always done relief education services and that’s really what we’ve focused on now, and we’ve really defined that,” she said. Some of those relief services include having caregivers for the elderly to help them with transportation and provide friendly visits; Christian Auto Repair to provide tune-ups and minor repairs to families in need of reliable transportation; The Christmas Shop for parents to choose gifts their children while giving back to the community; and temporary crisis service assistance to families. For educational purposes, Partners in Hope hosts poverty simulations for community engagement and education programs such as Getting Ahead and Bridges Out of Poverty to help individuals and families learn the skills to get ahead. “The education tools we have are broadening knowledge for change, and then our development programs support the journey from crisis based living to a secure and stable lifestyle,” she said. Partners in Hope’s individual-focused help has always been on the cutting-edge. Echols said the organization had records showing Partners in Hope was providing computer classes for women re-entering the workforce, assisting families that were battling mental health issues and helping people learn how to balance their budgets to get out of crisis living from the early days in 1990. Volunteers are a key part of organization. In the first year of Partners in Hope, there were 13 volunteers, while the second year had 22 volunteers. 2014 had many giving highlights. Among some of the highlights, caregiver drivers provided 426 rides to area residents over 55, which was a 28 percent increase. 977 intakes requests were completed at the office for families in need of services, while the Christmas Shop provided gifts for 92 families. That money went to support Van Cleve Sixth Grade Building’s D.C. Trip. 24 families completed the Getting Ahead classes, 15 vehicles were repaired through the CAR program; and tax preparation volunteers assisted 62 families with their returns. Partners in Hope was named the Local Area Provider for Bridges Out of Poverty Trainings in Miami, Shelby, Darke and Auglaize Counties. Those 245 volunteers gave 4,380 hours, which was the equivalent of having two or more full-time employees. Echols said the help of volunteers helped the organization combat the biggest factor in keeping an individual trapped in poverty. While it’s a lot of work for everyone at Partners in Hope, Echols said that people do achieve their goals, and watching the accomplishments as they happen is exciting. “We have families every year that we’re working with, and there’s one woman in particular who was with our program a year and a half ago,” she said. “She was taking a class right when I started working for the organization. Through taking the Getting Ahead class she received relief services and worked with her financial development coach, the family support coordinator and got help with applying for jobs. Oftentimes, former clients will send Christmas cards or letters sharing with Echols and the staff that they are doing well. In celebration of 25 years, Partners in Hope will be hosting three-time Nobel Peace Prize nominee, former U.S. House of Representatives member and former U.S. Chief of the World Food Program Tony Hall to come and talk. He will be speaking at 5:30 p.m. October 10.